12 lithographs and 8 etchings. 'Having arrived via the Endeavour during Maguire's series, ‘The Odyssey of Captain Cook', the ancient Greeks resolve to settle the New Land. In this collection of twelve lithographs and eight etchings, the archetypal hero is cast as New Zealand colonist. His objective: to claim and tame the land. But the process is unsettling. Maguire's Odyssey of Captain Cook was a play between three cultures: Maori at the moment of contact with Europe; ancient Greece, cited as western civilisation's source; and the Britain of Captain Cook's era, ‘The Age of Enlightenment', a time of renewed interest in Classical thought and style. The West having arrived the next step was to colonise. "Herakles, or Hercules as the Romans knew him, the embodiment of courage and strength of classical legend, has crossed the seas of time to transform the New World for those who would follow... Whether he is clearing forests and felling trees, battling with Maori warriors, writing letters home from Taranaki, or standing up to be counted at Gallipoli, Herakles appears as well focused on the tasks at hand as he was confronting the 12 Labours requested by King Eurystheus of Tiryns . . . killing the monstrous Nemean Lion, capturing the Cerynian Hind, cleaning the Augean Stables and so on... [Maguire] has combined authoritative borrowings and reworkings of earlier images - historical lithographs, pre-colonial drawings, old photographs, and the art and text of classical vases - to present layer upon layer of detailed myth and meaning, reference and allusion, appropriation and reinterpretation. 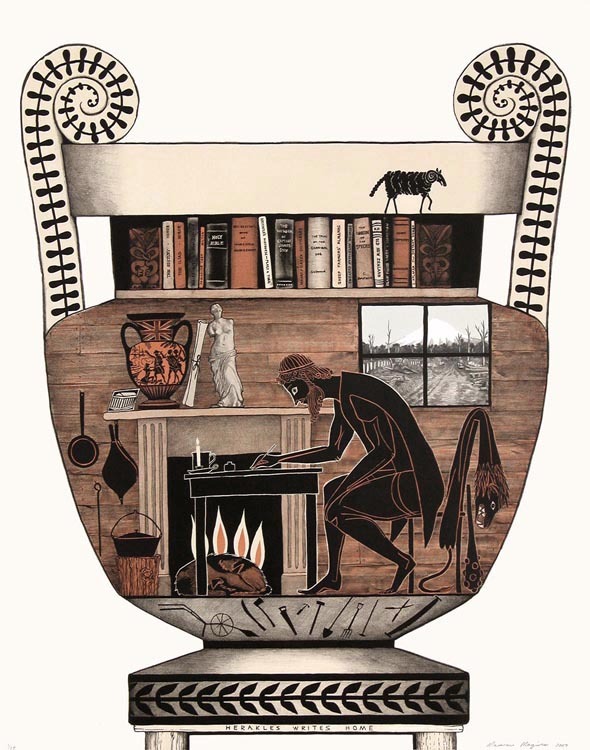 The lithographs in The Labours of Herakles exhibition are an elegant and often humorous union of the ancient and the colonial: of Herakles wrestling not a minotaur or a lion but a taniwha; of the Amazons as suffragettes; of Athena scolding him for his lack of progress; of Herakles trying to construct a chariot from No. 8 wire." excerpted from an article by Rosa Shiels (The Press, Christchurch, NZ, June 11, 2008). Herakles was no Odysseus, no leader of men. Wise and resourceful Odysseus, like James Cook, captained his ship intelligently, he made decisions for both himself and his oarsmen. Herakles, clad in lion-skin and wielding his club, displays other characteristics. He is strong, persistent, resilient. He never led an army, he worked alone. Set a challenge he will do his absolute utmost to see the task successfully completed without, for a moment, questioning the rights or wrongs of the instruction. The qualities Herakles displays - strength, patience, invention, fortitude - would have advantaged any pioneer tasked with transforming this country.